The main Floodwall parking area is at the south end of the 14th Street Bridge (Mayo Bridge) in Manchester. Find the eastern section of the Floodwall by walking under the bridge and the western portion from the parking lot. 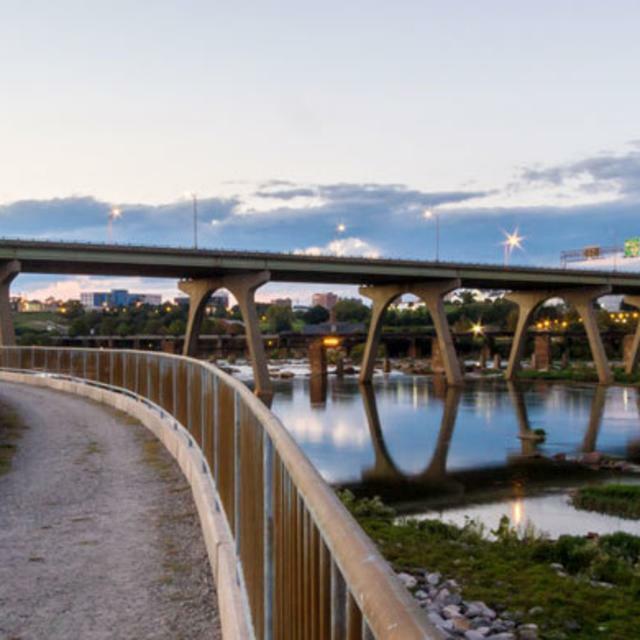 Both offer great views of the downtown Richmond skyline and the river.The wall is popular with hikers, runners, bird watchers and kayakers. There are plenty of spots to stop and watch the river at the beginning of the Falls of the James. Part of Floodwall is Diversity Park, a grassy, landscaped portion nestled in between the Manchester Canal and the Floodwall at the 14th Street Bridge. It was dedicated October 11, 2007. A marker at the site declares “this site is dedicated to diversity, mutual acceptance and inclusion among individuals and faith groups across international boundaries and political divides.” It has a sister site in Moster, Bosnia-Herzegovina.